Location: Salviac, in the Meurthe-et-Moselle departement of France (Lorraine Region). Notes: The castle of Lacoste is a castle located in Salviac, France.The barons of Gourdon founded the city of Salviac in the 10th or 11th century. There are few traces of the primitive castrum. Chateau Lacoste, known as "Les Templiers", is located on the old tower of the Cazelles, a noble house probably erected in the 13th century by a knight vassal of the barons at the supposed site of the western part of the enclosure of the primitive castrum. This noble house consisted of a square tower and a contiguous western wing. In his homage of Bertrand de Gourdon to the Count of Toulouse, in 1226, the fief of Salviac is included in his property. His son, Guillaume de Gourdon, founder of the abbey of Sainte-Marie de Gourdon, renewed the homage in 1246. His son-in-law Aymeric de Malemort, son of Géraud de Malemort, seneschal of the king in Quercy, received the inheritance. It was sold in 1310 to Pierre de Balène, then purchased in 1337 by Philippe de Jean, lord of Junies. Shortly before 1387, the fief became a possession of the Cazetons, who became barons of Salviac. 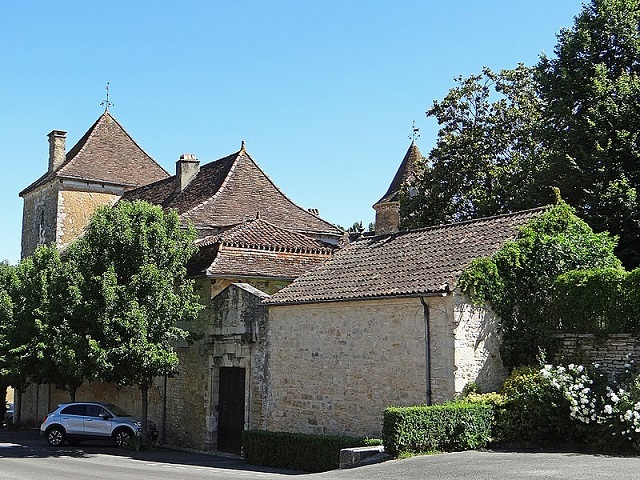 From 1438 the barony of Salviac returns to the Durfort-Boissières, who kept it until the Revolution. The stronghold was occupied in the sixteenth century by the Sirech. The medieval house was remodeled at the beginning of the sixteenth century by articulating the house around the circular staircase tower half-engaged in the northeast corner of two square wings. The castle took the name of Lacoste in the following century when it became the property of the Gransault-Lacoste. The Gransault family of Lacoste in the seventeenth century when its members are in charge of the management of the property of the lords of Durfort. Their success enabled Pierre Gransault de Lacoste to buy the castle in 1780 from the heirs of Jean du Sirech.